Danny Maun will coach the Heavy Woollen Select side against Batley Bulldogs, where he made over 250 appearances. Former Batley fans’ favourite Danny Maun will coach the Heavy Woollen Select amateur side who will face the Bulldogs on January 25. The best amateur players in the area will come together for the first time this Saturday under the guidance of Maun, Dudley Hill coach Danny Thomas and Birstall Victoria’s Richard Hunter. An initial squad of 25 will be whittled down to 20, who will face John Kear’s Bulldogs as part of their pre-season programme. Maun said: “I want to make this a real occasion for the Heavy Woollen lads involved and hopefully it can become an annual event. “I watch a lot of amateur rugby in the area and there is some real talent. I’m sure there are at least five or six of the team who could make the step up to Championship or Championship One. 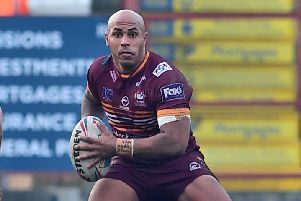 Maun admits the amateurs will face a huge task against the professional Bulldogs but is relishing returning to Batley, where he made over 250 first team appearances. Maun admits he is already excited by a number of younger players, including Thornhill duo Joel Gibson and Mindaugas Bendikas, along with George Croisdale and James Delaney of Dewsbury Moor. Maun has selected a quartet of experienced players in Aidie Moore and Andy Robinson (Dewsbury Moor), Brendan Sheridan (Birstall Vic) and Andy Burland (Shaw Cross), who he hopes will lead the side around the park. Maun added: “The result doesn’t really matter but I hope everyone gets something out of the game. “It would be great if one of the younger players could take their chance and get noticed and what Alex Walmsley has achieved can have a massive influence on these players.